We’d been wanting to get a brew on with Kveik yeast for some time after hearing from lots of customers about how they had been using it and after reading lots of online material about it. 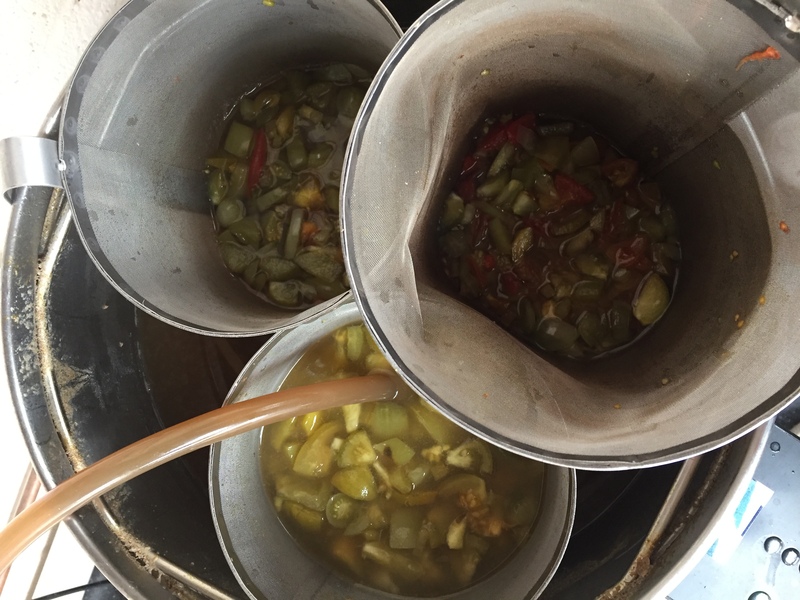 One customer had told us how he used it to get a stout done in 3 days, others had told us how great it was for producing a clean fruity IPA with no worries about high temperature fermentation, it just sounded so multipurpose and like a super yeast. So I needed to do a brew for the local home brew meet up and as normal have left it right until the last minute as the meeting is in 2 weeks time. The theme everyone was given was a beer with berries, so as we had a large batch of tomatoes growing at home I thought I’d do something along the lines of Scratch Brewing Green Tomato Beer . The brew took place on Saturday the 15th of September, and didn’t really want to go with the saison yeast, but thought this was the perfect chance to split the batch and try out two yeasts I’d been dying to try, one being Sigmund Voss Kveik from the Yeast Bay, and the other being the Sour Patch Kidz from Imperial. But lets just focus on the Kviek yeast for this posting, as this is the one I thought I could get ready in time for the meeting on the 29th of September. 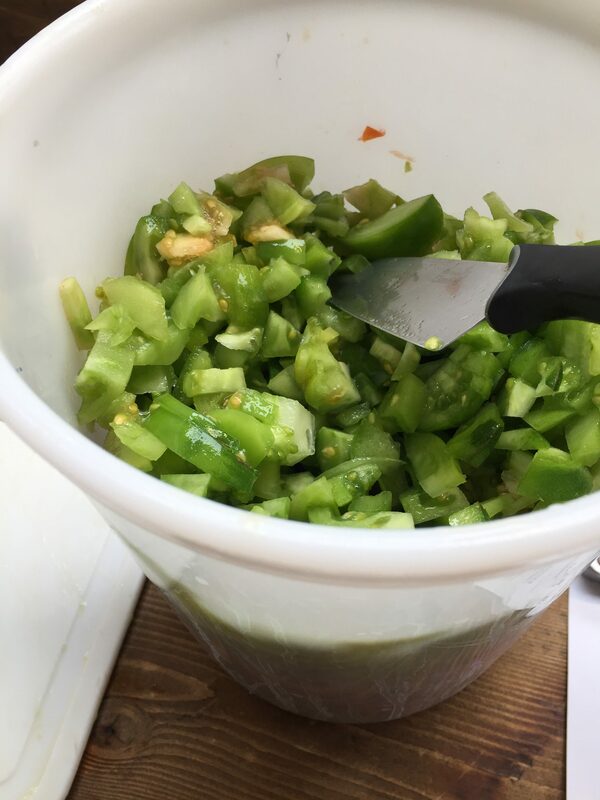 I used roughly 4kg of green tomatoes from the garden in the beer, the recipe said to use a food processor, don’t ignore this bit like I did, as chopping this amount of toms takes a hell of a long time and I think it needs to be more pulped than I achieved. These went in at the end of the boil, used almost as a hop stand along with the Citra pellets, and I left them to steep for 20 minutes, mashing them a bit with the paddle. Oh and I put them in hop spiders to try and contain the mess and prevent the filter getting too blocked. I got two fermenters with about 12ltrs of wort in them, perfect for the experiment. I would warn that if you leave the yeast out of the fridge to get to room temp whilst you brew then be prepared for it to really come alive and open it over the fermenter as it will be lively. 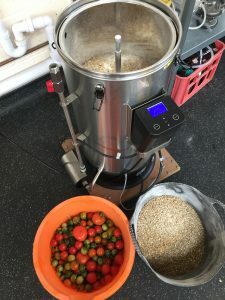 The Kveik yeast was pitched on Saturday 15th of September at OG 1.048, left out to generate its own heat and the heat in the building was about 15-18c, mainly because I didn’t have time to set our fridge up, yes a bit of lazy brewing. Took a reading on Monday 17th when back in work of 1.036, moved to fermentation fridge and temp set at 25c to speed it up a bit. Took another reading Tuesday 18th of 1.016, temp increased to 30c. Also added in 15g of Citra pellets as a dry hop addition. The taste of it on the two days I took a reading wasn’t like tomato ketchup if you were wondering, its was sharp sweetness to it, the yeast wasn’t tasting like any other farmhouse saison style of yeast would, there was none of that funky tones to it. It just tasted really interesting, it also had a nice juice looking colour to it, you know like those great NEIPA beers. At this point I thought it was all going to happen, I could be bottling this on Friday, giving it a week to bottle carb nicely in time for the 29th, and that maybe this is my new favourite yeast which is totally suited to my last minute plans of got to get a beer ready for something. 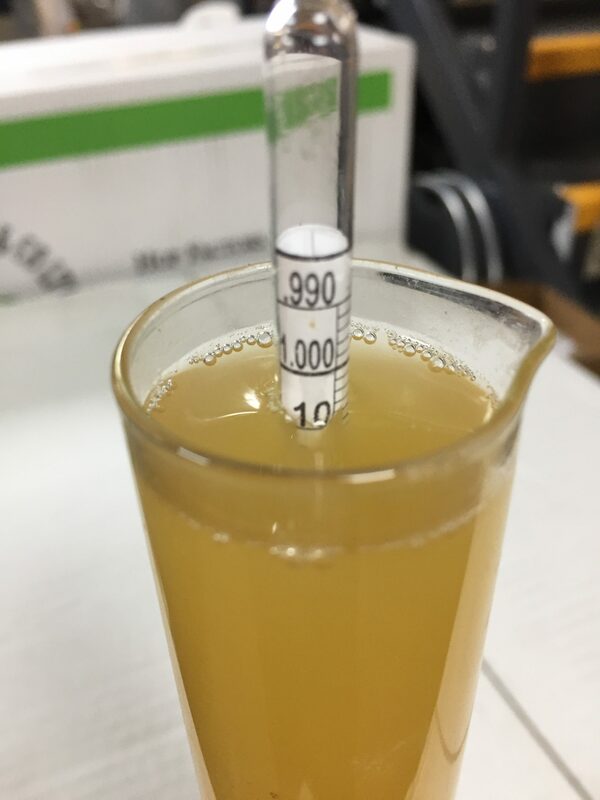 Wednesdays reading at 30c was done, and the yeast also seems almost done, we’re down to 1.012, but I thought I’d leave it until the morning to start the cold crash as that will then give me about 30 hours for everything to drop out and the hops a little more time with active yeast. So the Thursday it was then down to 1.008, I was happy enough with that so set it to 4c to cold crash for a couple of days. Time then got the better of me and it was going to be Monday before I could find time to bottle it. 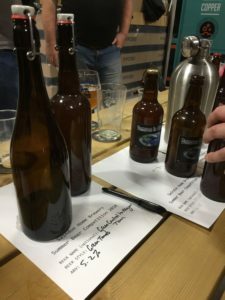 The beer was put into my easy bottling solution, which is using some 750ml swing top bottles, and a tea spoon of brewing sugar in each bottle using Robs magic sugar spoon (ask him more about that if you see him). Saturday came, the day of the Swindon Home Brewers meeting at the Hop Kettle Brewery, so I stuck two bottles in the fridge to have them chilled for the get together. Faced with having to name my I christened it ‘Green control to Major Tom’, I do love a good pun named beer. It faired well, its not judged to any rules, its just a case of those that come bring beers, everyone chooses their favourite and then Tim the head brewery there makes the final call. Three beers all got equal group votes including mine, and in the end Tim went for the most berry like beer which was from one of our regular customers who we all love anyway as he brings us biscuits when he visits. 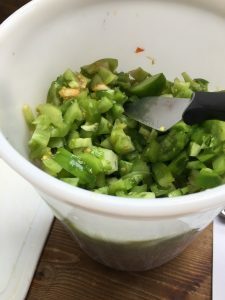 In terms of taste, everyone said there was a slight tomato taste to it, an almost freshness of that smell when you touch the leaves on a tomato plant, and then a slight little tartness along with a citrus dryness to it. It all got drunk, which to me is also another vote that its a decent beer. UPDATE: Its now the 19th and I’m still drinking the bottles of this at home, its turned out really nice, its certainly something I’d brew again next year. Oh and the other fermenter with the other 12ltrs in it got a packet of Imperial Sour Patch Kidz added to it and is still sitting in the fermenter and tasting nice and sour, but more about that another day.